So glad you are visiting today! We've got lots of Christmas goodies, so let's get right to it! First let's announce Day 1 winners! Winners: Be sure to email me (email in side bar) and I'll forward your info to our wonderful companies providing such awesome gifts! And Leslie, I'll need your address so I can put your buttons in the mail. Thank you! The Cutting Cafe has gillions of cut files. You could get lost for a day or two just looking at all the fun stuff! I think this Trio Butterfly box is just wonderful - can't you see a gillion possibilities just for it? 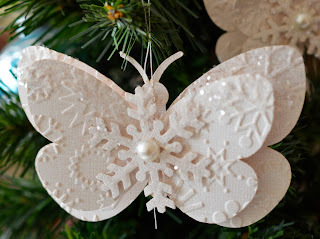 I also used the butterfly cut files to make some butterfly+snowflake ornaments. Everything goes together super easy. 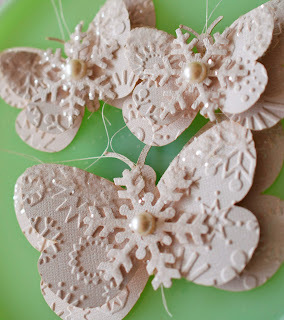 I started with a long lead and sewed right down the middle of the largest butterfly on each ornament. It worked perfectly for the hanger! Regina from The Cutting Cafe is offering one lucky commenter 3 sets of your choice! Just say you want to win in your comment! You may have seen a couple of the Hershey Kiss Countdowns I did earlier. This one is topped by a darling vintage image Santa from Vintage Bella. 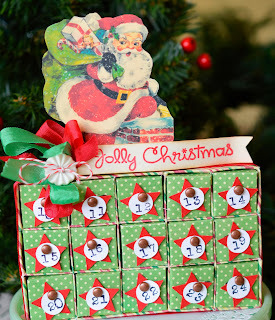 You can find all the directions for the Hershey Kiss Countdown here. The only changes I made were: set it up horizontal and use a petal envelope cut file from Silhouette sized down to 1" for the doors. Tip: Use sturdy paper. I used 110 lb and printed patterned paper on both sides. These are a big hit! Vintage Bella is giving one commenter one digital set of your choice! Just say you want to win in your comment. Today is the also the second day of the Paper Sweeties December Release! I've made a fun pop card with the darling snowgirl and snowflakes from Thanks Snow Much stamp set. There are tiny dies for the snowflakes - isn't that cool? 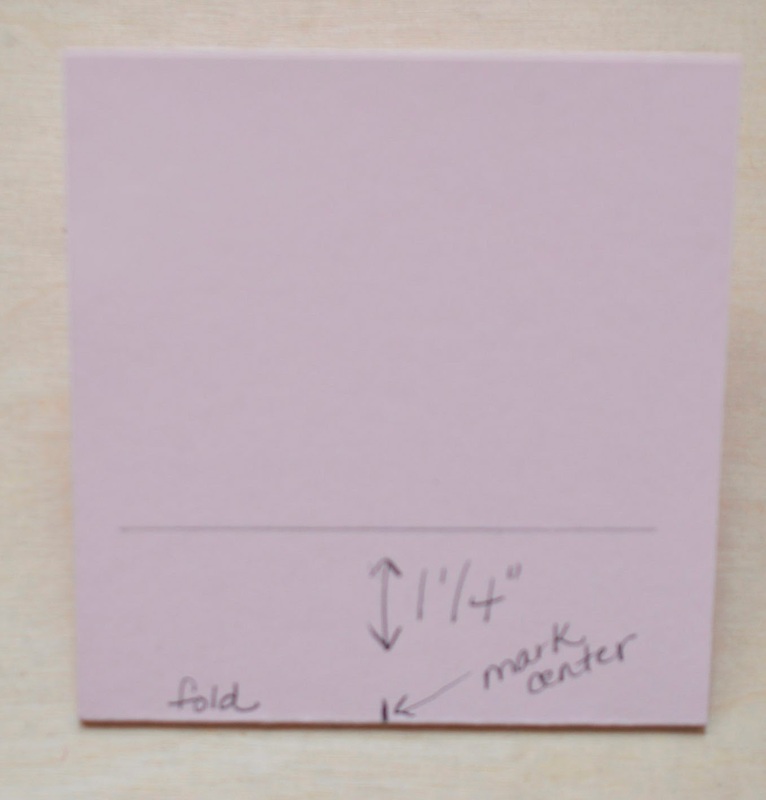 This popup stands about 1 1/4" and is about 1 1/2" inches wide. That seems about right for most things. 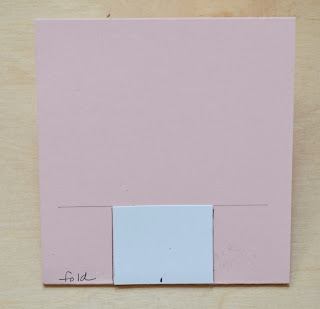 I make a little cheat rectangle. Just to make sure I don't make any mistakes! 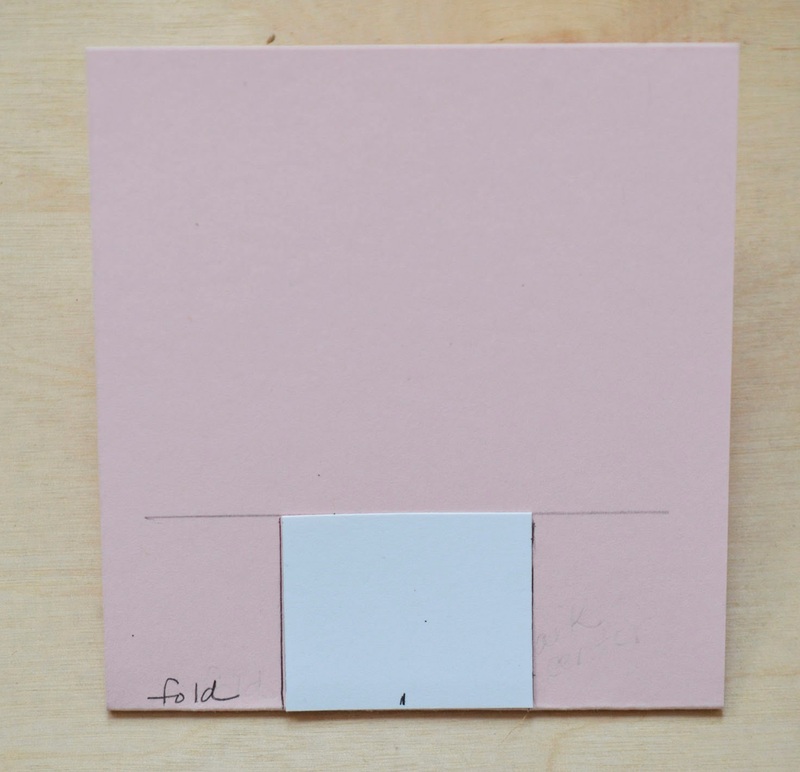 Match the center dots on the cheat and on the card base. 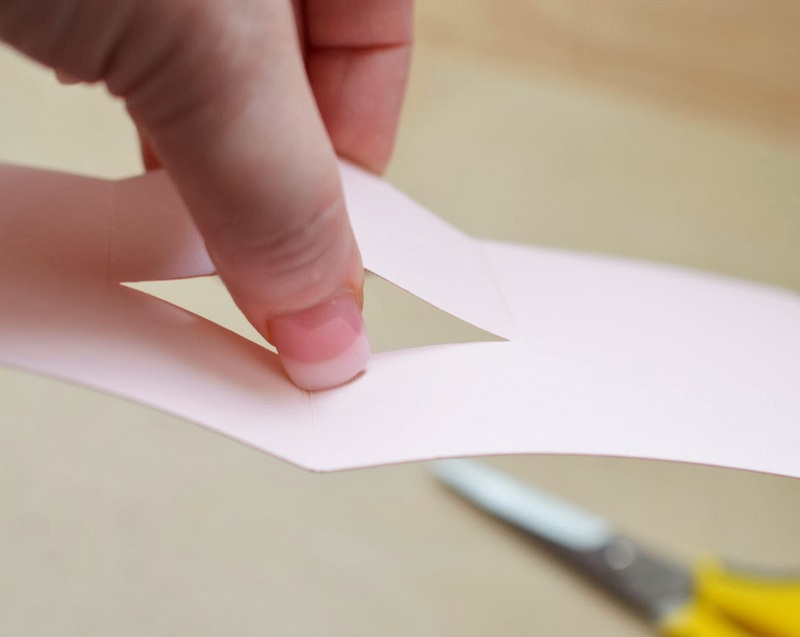 Draw two lines - one on each side of the cheat rectangle.Then make just two cuts through both thicknesses at the fold. Pull it forward until it folds inside. That is it! Super easy. Here's the finished card from the side and back. 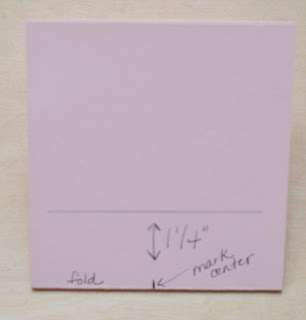 It looks kind of bad to have an open hole, so wrap the back side of the card base with decorative paper. 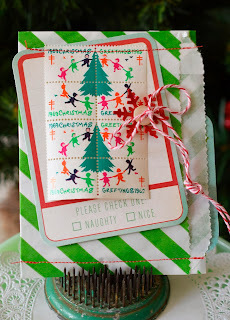 Visit the Paper Sweeties blog to see more ideas for the December stamps! Debbie from Paper Sweeties of giving away a $10 certificate! Just say you want to win in your comment! Welcome to Paper Haus Magazine Winter Frolic! The new Paper Haus Magazine has been released! It is filled with beautiful holiday projects. Aren't they fun? 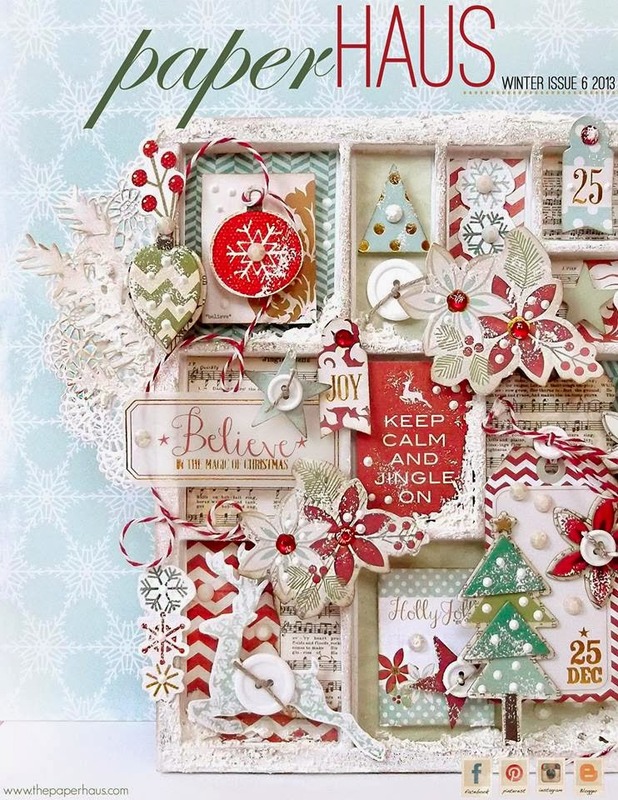 Check out my third Christmas seals card in the magazine above. 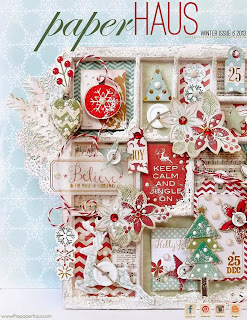 The Paper Haus blog hop continues through the week and there are giveaways there as well. Your next stop for the Wnter Frolic is Viva Las VegaStamps. 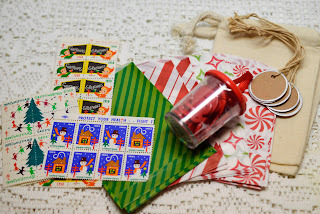 Vintage Christmas Seals, 20 mini Christmas bags, red buttons, kraft circle tags, and two muslin drawstring bags - all added to yesterday's items! 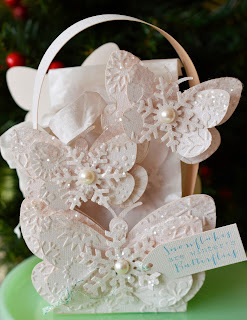 Where can I find the card stock you used or the butterfly trio design. Love it! I just love all the designs! I love, love butterflies so much! So talented, thank you for sharing and inspiring me. I would love to win any of the giveaways! Hugs and kisses! Thanks so much for the win from Day 1 - wow! Day two - just hopped and it's another full hop of inspiration and talent. I love your gift bag with those beautiful butterflies! 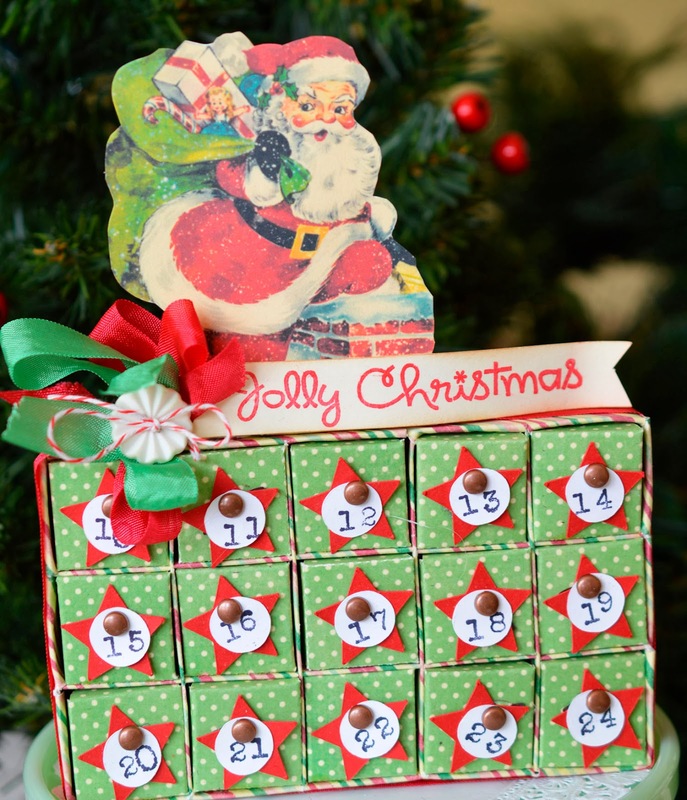 What a sweet pop up card, fabulous advent and love the card holders and use of the Christmas seals! TFS for another great day. wow such a fabulous post.. congrats to the winners... those butterflies are GORGEOUS..
wow you ladies are very talented. I am going to try to do the pop up card. 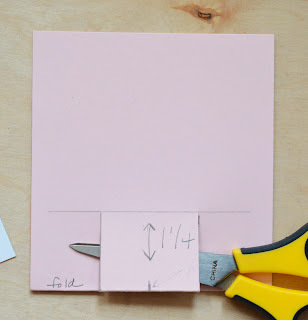 Thanks for the tip on centering. love the butterflies. Just love your christmas calendar! I just LOVE how you've used those Christmas seals, I remember them! I bet people LOVE to receive them on cards/tags/etc they are adorable and nostalgic! What a fun read! Congrats to the SugarPlums winners... and what lovely creations for the Paperhaus hop (which is how I got here today!). Thanks for a lovely festive post! Well, well, well.....you peeps are having fun with all your giveaways here, aren't you!!!! There are so many giveaways going on in craft blog land, I can't keep up with them all. So I will leave you lovelies to your prizes and just be here for the PaperHaus giveaway, only. Really love your vintage Christmas seal cards. I remember that set from your birth year!!! :o I am old. :) I love using postage stamps on my cards, but I hadn't thought of using Christmas seals. Those old ones really bring back memories. Lovely idea!!! Wow so many lovely creations!! Such great creations! Great work! So much to see and admire! Wow, what super creations - this hop gets better by the day. TFS and giving us a chance to win such super goodies. Oh wow these are all lovely, esp love the countdown boxes!!! I'd love to win!! So many things to win - and I want to win them all. Santa on the counting box, the penquin wrapped up in his sweater, the certificates from Paper Sweeties and Nicecrane and the design from Moonlighting by Mary. The butterflies are beautiful. Love the embellishment and then stitching them together really makes them pop. What gorgeous creations.. I would love to win Thankyou.. 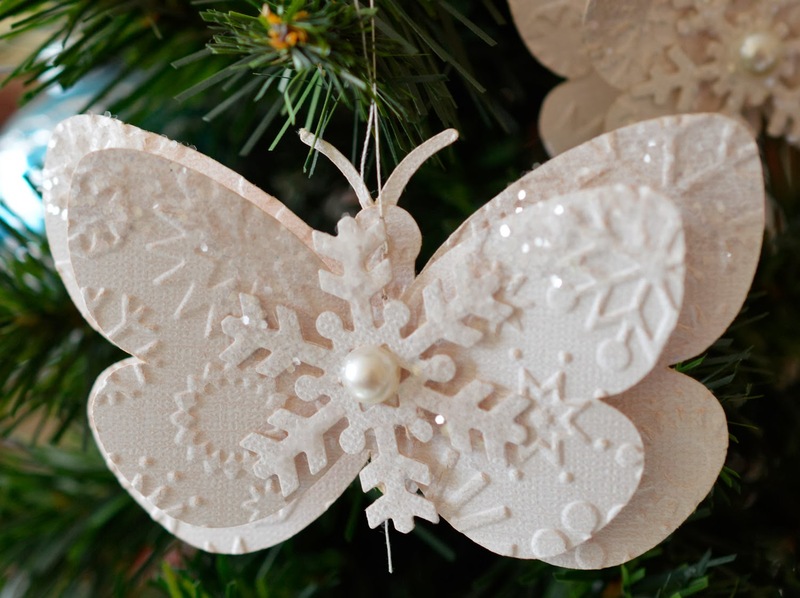 The snowflake butterflies are amazing...so very beautiful! The snow girl is darling as well. everything is just beautiful, I love, love butterflies and love how you used them in different ways, I would love to win, and I'm inspired to create some holiday cards. thanks!!! Cieszę się, że miałam okazję, żeby Cię odwiedzić, ciekawe pomysły, zwłaszcza świąteczne motyle :) POzdrawiam. Oh my goodness! So much awesomeness here today! Would LOVE to win The Cutting Cafe's gift so I could get the trio of butterflies! Every time I see a butterfly I know that Joseph (my neighbor's 7 year old son who left us 10 years ago to become an angel) is saying Hello to me! Seeing a trio of them must mean he is really watching over me today! Would love to win any of the prizes but that one has the most meaning to me! Now, on to your creations! The trio of butterflies is gorgeous and I LOVE your advent calendar! 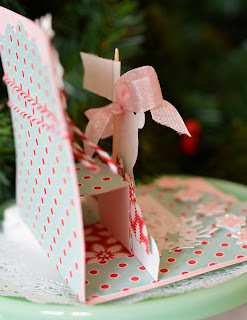 The card is adorable and thanks to your tutorial I can give it a go or myself! Thank you for all the chances to win some amazing prizes!!! Fabulous creations .. I love the Christmas seals (I remember them) used on your cards. Thank you for sharing your talent with us! I love the butterflies! Thank you for introducing me to the Cutting Cafe. They have lots of goodies for my Silhouette. I'd love to win the Fun with Snowflakes set. Vintage Bella has so many pretty designs. I'd love to win the Vintage Christmas 1930s Landscape Christmas Card from them. I love the Guess What set from Paper Sweeties. I love the folded gift card holder you made. It reminds me of my childhood. Shhh...don't tell! I was born in 1959. Thank you for all the giveaways! Thank you I am one of the winners for day 1!!Yiippee! Loving the PaperHaus hop, so much fun inspiration! Oh my goodness - the butterfly trio is absolutely gorgeous!!! WOW!!! I would LOVE to win the cutting café giveaway!! I love your cards and also the directions for the pop up card!! thank you! Wow, lot's of goodies. Love your square card. And I want to win it all! Those butterflies are just gorgeous. I love how festive they look!! So many pretty creations, Lori! Fab work...well done! So much wonderful inspiration and so many fabulous give aways! I would love to receive any of them! The butterfly trio was simply gorgeous. I love your Hershey countdown box too. Thanks for sharing. So lovely ! 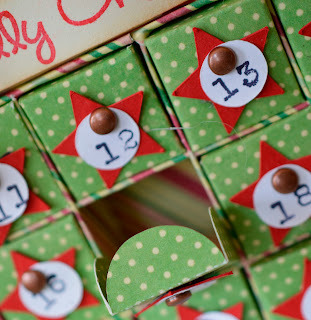 I liked the vintage touch it has..thanks for the blog hop ! Wonderful projects! Those butterflies are lovely! Just wonderful projects no doubt! Gorgeous Lori! Wow what amazing projects! And what amazing prizes! Who wouldn't want to WIN?!?! I just found you from Pinterest, oh my, I love your style! I'll be back. My brain is doing a happy dance looking at all this prettiness!! I think I will get my morning coffee and stay awhile!! So pretty! I love that butterfly!! Great cards, love all the snowflakes. Im on a snowflake binge here lately and loving all the millions of designs. Are these dies, I don't have machine for cut files. Another fab day and release of paper haus. This is a delightful card-I love how truly vintage it is! Your cards it's very beautiful! love the white on white with sparkles! 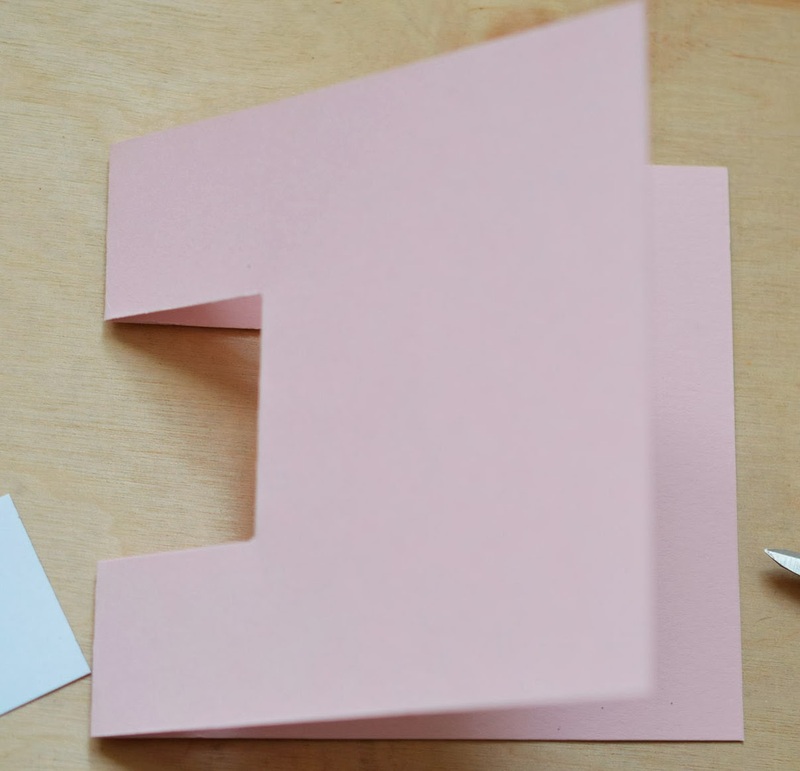 I've never made a pop up card, you make it look easy! lol will have to give it a go! beautiful card and love the cordinating gift bag. I am a little late, but cute bag! LOVE! Thanks for the inspiration! Great fun cards. Love those stamps.